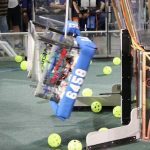 This post contains the details of the 2018 BC FTC Championship on February 17 2018. After the qualifications matches the top four teams were selected as alliance captains. They then choose a team to be their partner. The following four alliances participated in elimination matches.